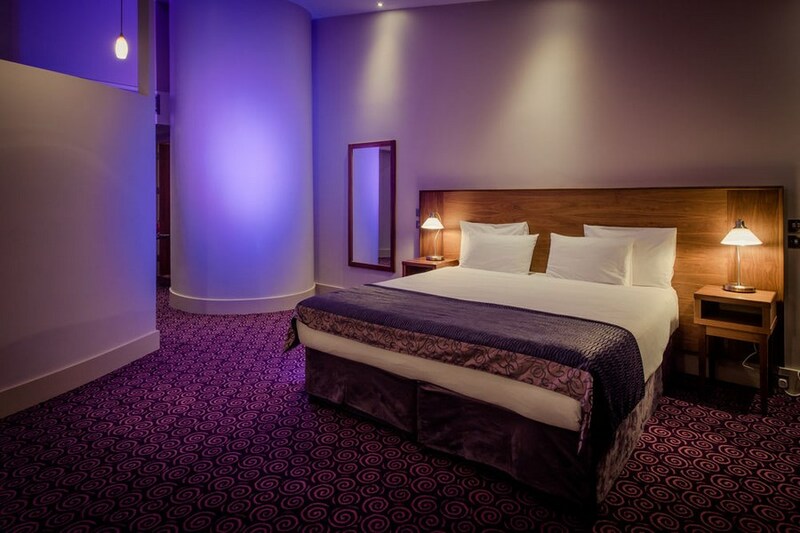 This 4-star hotel offers a warm welcome with great service and facilities, located in the vibrant town centre of Naas. Offering luxurious guest bedrooms, with sleek, modern bathrooms. The hotel offers a Spa, health and leisure club with a 20metre swimming pool and kids pool. Mash restaurant offers international fusion cuisine, whereas Statler Bar and the Waldorf Lounge offer a more relaxed dining experience. On sunny days you can enjoy food and drinks in our courtyard. Dance the night away each weekend in our Time Bar and venue. Complimentary on-site car parking, wi-fi and daily newspapers. A kids club operates in the summer months for 4-12 year olds and we have just added a new baby room. Directions from Dublin (Newlands Cross): Driving outbound on the N7, on your left hand side you will pass by Citywest and Poitin Still. Continue straight and you will come to Johnstown Garden Centre on your right hand side Take 2nd exit off N7 for Newbridge/Naas. At the top of the slip road turn left where you will reach a roundabout, take the first turn left for Naas. You will be coming in the old Newbridge Road. Continue straight until you reach the Kildare Civic offices (which is a large glass building on your right hand side) and the Naas Town House Hotel (on your left) At these traffic lights here, take an immediate right turn just after these and the Osprey Hotel is directly in front of you. 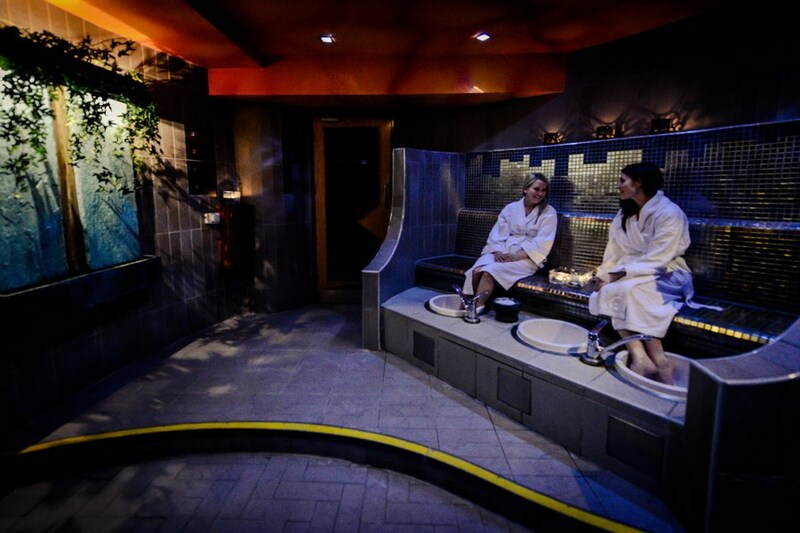 The Osprey Hotel & Spa, is located in the bustling town centre of Naas. Just a 35 minute drive from Dublin City and close to all major routes. Naas is renowned for its clothing boutiques which are a must! Kildare Village which is an outlet centre is within a few minutes of the Hotel and has a great selection of discount stores. As a guest of ours you receive a 10% discount. Ask for details at the Hotel Reception Desk. Kildare is well known among the horse racing circuit and within easy reach of the Curragh, Naas Racecourse and Punchestown. For anyone that likes driving at speed, Mondello is worth a visit. Absolutely loved my stay, the staff were lovely, the room was absolutely fantastic and the food/service was excellent. Nice hotel. Pleasant and helpful staff andf well done to them. Booked an executive room and it was spacious and well appointed. TV was small for the room size and no children's channels free, all music via TV is an expensive pay per view offering. As others have mentioned the bath towels could be increased in size and number. The breakfast hot food is served (effectively boiled ) in hot plate self service fashion, leaving the bacon, sausages etc. most bland and unappetising. I saw many people check it and leave it alone. So for management a few pointers for improvement. All in all it was a good location for two nights. The staff were very helpful and attentive in providing us with directions to various locations in the area. The room was very clean and spacious and the bar food and breakfast was very good. I would highly recommend this hotel. lovely room, roll top bath. dinner very reasonable and very good. could do with some extra staff in bar and at breakfast. Would stay again and for longer. For a four star hotel I was expecting more...they actually didnt have my booking when I arrived but luckly had rooms available. I did get a suite, the best part of which was the fabulous bathroom. The bedroom was ok but the lounge area of the suite had chips out of the furniture, a battered blind on the window and was generally tired looking as was the rest of the hotel. In its day it was probably gorgeous but it is in need of redecorating and some tlc...the woodwork and carpets in the bar area were grubby and in need of a good cleaning. The staff were friendly and the bar food was good but I would not stay there again. The room was lovely even though the view was a car park. Everything you could need was provided in the room including complimentary Ballygowan. The bathroom was lovely and plenty of space. The spa was good and relaxing as I was there without the children and pool was full of noisy kids earlier in the day so I would advise those getting a break from kids to go the pool after 6pm. There was lots of facilities for families with kids. The hotel is very big and a maze to find your room which we found funny after a few drinks. It is very close to the town and worth the stroll. The breakfast was good and they serve until 11am which allowed a leisurely start. All in all very good value, staff friendly, relaxing break and would stay again. Excellent Hotel & Staff. Unfortunately only had time for one night stay, and did not get a chance to partake of the Leisure ,Oh well perhaps the next time. Food & Service could not be faulted.Would love to come back again another time for a longer stay. Mary Naughton Castleblakeney, Ballinasloe. Great hotel with really nice staff, will stay again. nice,modern, and relaxing. the rooms are spacious and well kept,very reasonably priced, and the food was nice.the staff are very pleasant. Lovely rooms,we would have loved a nice warm jacuzzi,but the pool was nice....plenty of car space and food in bar was fine.Lovely buffet breakfast in the morning,staff were very friendly.No complaints ,would stay again. I stayed on the 17 April for one night with my daughter. This is the third time I stayed here and am delighted to say each time I stayed I found the staff to be very friendly which makes your stay more enjoyable. The food was lovely and the rooms were very clean, big and bright. I was in different rooms each time I stayed and they were all lovely. I will certainly be going back again. Brillant hotel. We are a family of 5 and stayed two nights All staff friendly and very helpful. we ate in the resturant and the bar. All food top class. Rooms big with all mod cons. We were well impressed and will stay again. Well done to the osprey and their great staff. Sunday 7 Apr. Lovely Hotel, We were upgraded to a lovely big room with a balcony. Bathroom really Fab. Staff very friendly and very heplpful. enjoyed a nice meal in the resturant. Resturant manager very attentive. One small problem in the leisure suite, Hot beds were cold or not working properly and water temperature in the pool said it was 29 degress but didnt feel like it. That said we would stayin this hotel again. 4 Star rating. Great hotel at a great price too. We stayed for one night with an evening meal and breakfast included. Staff were very welcoming and attentive and our room was huge! The grounds of the hotel itself are fab and I would imagine it is a nice place to relax during the summer. The food was delicious at dinner and the breakfast buffet was very well stocked. I would definitely return. Lovely hotel & facilities - nice helpful staff.... Restaurant a little overrated but my tastes are simple! Parking is available but spaces are tight so dont bring the 4x4! Bathrooms are nicest I've been in anywhere - beds comfy, in-room furniture showing a bit of age but still nice. Bar is amazing - and the bar food much better than restaurant... Unfortunately didnt get a chance to try out the Spa or leisure facilities but overall great - will be back too! We had a great time in the Osprey, the staff were really friendly, the facilities were excellent and they were very family friendly. We had a lovely big room with an extra camp bed for my 3 year old niece. I liked that they gave us plenty of towels in the rooms and had family changing rooms at the pool. We really enjoyed our stay and would definitely go back. We enjoyed our overnight getaway in the Osprey, got a great value deal. 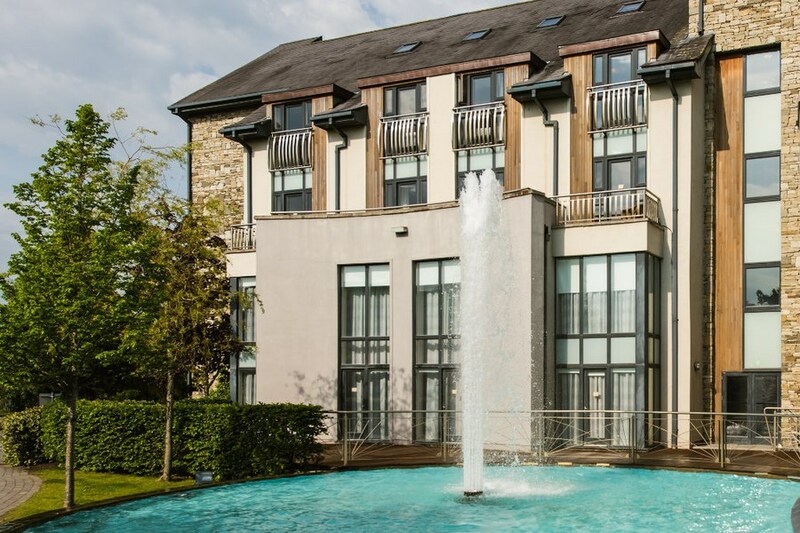 This is an unusually designed hotel in Naas, 5 mins walk from the main street. Despite being newish, the design makes this hotel more interesting than the standard right angle, parallel lines of modern builds. Free parking, wifi, bottled water in room and newspapers enhance the welcome at reception. The room and partiicularly the bathroom is comfortabe and well fitted out. The staff are professional and friendly. Personally I don't like so many TVs in the bar. The food was generous in portion size and served hot to the table - perhaps too efficiently, we had our 2 course meal in 45 mins! There is a gym and pool available and we enjoyed a treatment in the spa. My sister recommened the hotel and i wasnt disappointed. The staff were excellent, they were helpful, friendly, accomodating. Arguably the best hotel staff ive experienced. The room was a fantastic size, most probably the result of an upgrade that was given without request, making it particularly appreciated. Only downside of the stay was that the temperature of the pool, particularly the kidies pool and relaxation pool was a little on the cool side, meaning we our daughter was too cold to spend more than a couple of minutes in it. This was a beautiful hotel. We had a family room which was huge and the bathroom was very nice too with a free standing bath & seperate shower. The staff were friendly & helpful. It would be great if there was something for kids like a playground area but they loved the pool which has a children's section. We really enjoyed our stay. Beautiful hotel, excellent facilities and accommodation. Rooms are very big & spacious with a fantastic bathroom. Staff in the hotel are very friendly and helpful. Food to an excellent standard and service just as good. Highly recommend a stay in the Osprey Hotel, excellent value for money. Excellent service & 5*+ staff! Lovely room & great value. Can't recommend anything better! Lovely hotel. Staff really friendly. Good location if coming from Limerick. Food really nice. Brill hotel. Really great staff and perfect for kids. Amazing food too. Loved every minute. Would highly recommend it. Fabulous hotel, food excellent spa & treaments first class ..... Room/suite beautiful unfortunately the noise level was appawling from other visitors, this was my only downfall and we definitely eat and use the spa again on a day visit but don't think I will be sleeping there !!!!!!! My friend and I are just back from a mid week break in The Osprey Hotel. Oh my god! what a hotel. It was very comfortable and very clean. Our room was huge, light and airy. The food was fantastic. And breakfast till 11.00 a.m. The lovely, friendly staff couldn't do enough for us. The facilties were brillant. We could not recommend this hotel highly enough. My husband and I are going to stay for a weekend break in december and I can't wait!!! 5 star hotel in the making. Had a very enjoyable stay,lovely staff very helpful,hotel was spotless,food devine,as time night club was part of our package we did go for all of 5mins did not like it.just a bit of advice would not advertise TIME NIGHT CLUB with any of hotel package. Stayed for 1 night. Lovely hotel. We got a complimentary upgrade into a fab and spacious room. Dinner was ok, not delicious. Would deffo go back. We stayed for 2 nights and really enjoyed our stay , lovely hotel , very helpful staff , delicious food .....would definitely go back again !! We had an excellent room in the Osprey this week and a really really nice stay. They do have special offers in the spa for mid week but they aren't advertised so ring ahead and ask about the special offers. Unfortunately they were all booked out when we arrived. The staff were lovely and welcoming. We ate in the bar and the food was very good. My only issue was that the air conditioning wasn't working. I had stayed a few weeks previous during hot weather and it wasn't working then either - bit disappointing.